EMMA2 aims at revealing the distribution of 264 mammal species in an area of 11.59 million km2, from the Atlantic coast in the West to the Ural mountains in the East and from Svalbard in the North to the Mediterranean sea in the South. 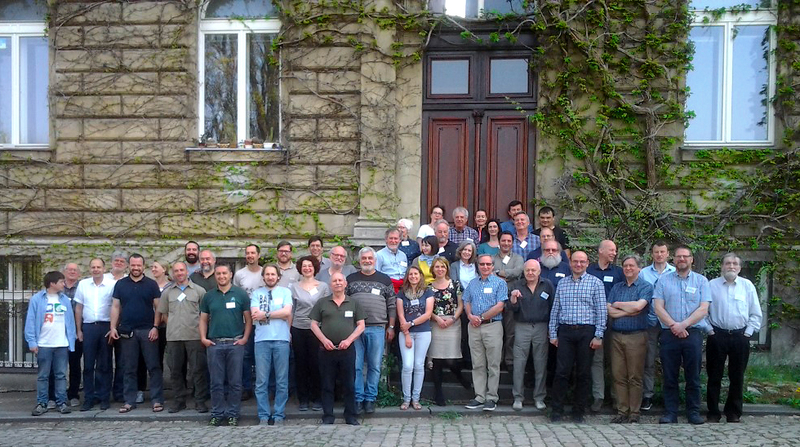 It is a huge challenge led by the European Mammal Foundation.More than a year after the start of the project (it started officially at the end of 2016) the National Coordinators met in Prague to share information about the progress of the European Mammal Atlas project, as well as providing advice and assistance to anyone that needs it. 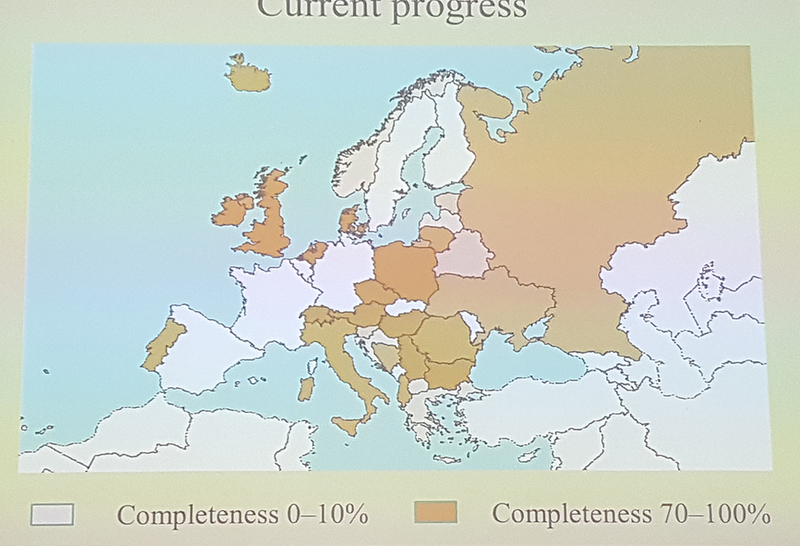 Laurent Schley who chaired a session where national coordinators made a brief oral presentation on the current data-collection situation in their country and progress to date, commented that an impressive amount of work towards the atlas had already been started. With 5 years of data collection still to go, the project appeared to be on track. He was especially delighted to hear that the European atlas project has clearly stimulated the setting-up of new national atlas or database projects in several countries and encouraged new work in others. Several countries have web portals where everybody can upload sightings of mammals (and other species) making the new European atlas as up to date as possible. A discussion on data management highlighted the need for clear guidance on topics such as the treatment of records with imprecise georeferencing, the recording of vagrants and wandering individuals (especially wolves, jackals and wolverines) and the tagging of records to allow traceability. There was a clear need for a data coordinator to help with the data-management work and ensure consistency in the atlas database. The Steering Group will prepare or update this guidance over the coming months. For some countries, where mammal recording is less developed, there is also a clear need for further resources, particularly field equipment and help with data management software. The European Mammal Foundation will try to help with this, either by bidding for resources itself or by supporting bids for national coordinators. As well as the published atlas, which will be attractive to libraries, Universities and Research Institutes, maps prepared using the atlas database will be freely available on the SEM website. The final atlas database, at the 50 x 50km resolution used in the atlas will also be uploaded to the Global Biodiversity Information System (GBIF). Henk de Vries from the Netherlands Biodiversity Information Facility (NLBIF) gave a presentation about GBIF, which accepts, stores and provides biodiversity data from anywhere in the world. The GBIF operates through national nodes in member countries, such as the Netherlands, and promotes the sharing of biodiversity data in an open and transparent way. GBIF is committed to the principle of Findable, Accessible, Interoperable and Reusable (FAIR) data. Everybody interested can use the system for downloads, uploading is done by more than 1100 publishers all over the world. NLBIF has sponsored this meeting because it is interested in intensifying the use of GBIF for the exchange of data about mammals. 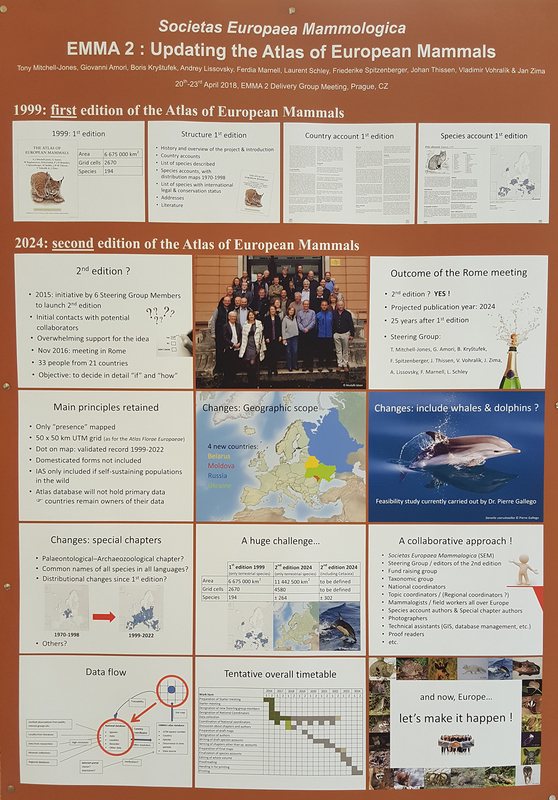 The European Mammals Atlas will become available in GBIF, but more detailed information of the records is welcome. Standard formats for datasets can be found at GBIF.org. Henk encouraged participants to check what mammal data were already on GBIF for their country and hopes many participants will use GBIF to make their records of mammals available to others. The meeting in Prague was attended by 47 members of the Delivery Group, from 30 European countries. 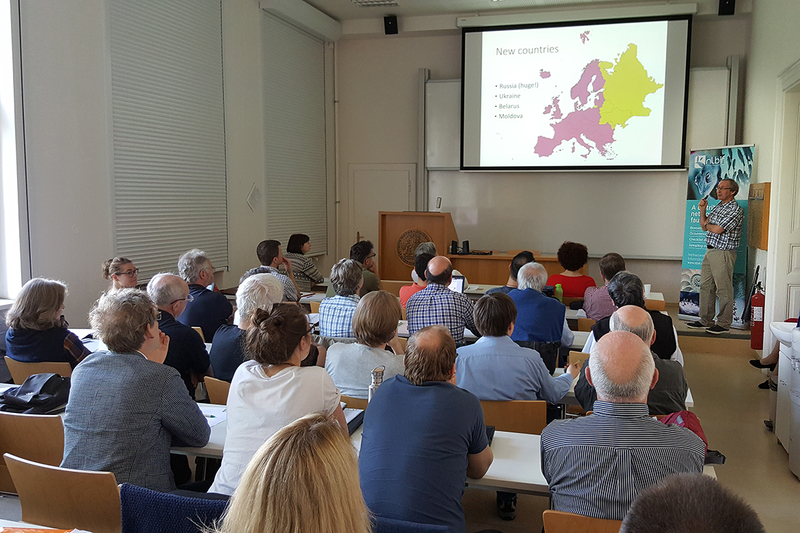 Having these people together, Dennis Wansink used the opportunity to plead for improving cooperation between mammalogists across Europe so as to achieve greater influence in mammal conservation. He proposed that the atlas project could provide a good stimulus for improved cooperation and that the network of contacts for the atlas could start this process. 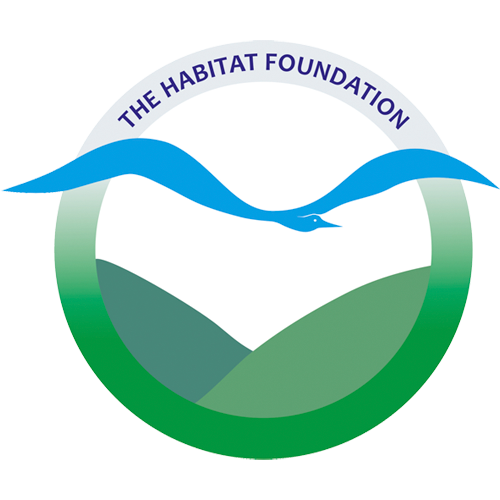 The meeting was an initiative of The Habitat Foundation, financed by Foundation NLBIF and realised in cooperation with the Dutch Mammal Society, the European Mammal Foundation, the Nature Conservation Agency of Luxembourg and the Charles University in Prague.